The upcoming Spanish General elections, to be held this coming Sunday, are noteworthy in several aspects. Not least of these is the resurgence of Podemos as a viable player, after a year of steady decline in the polls. 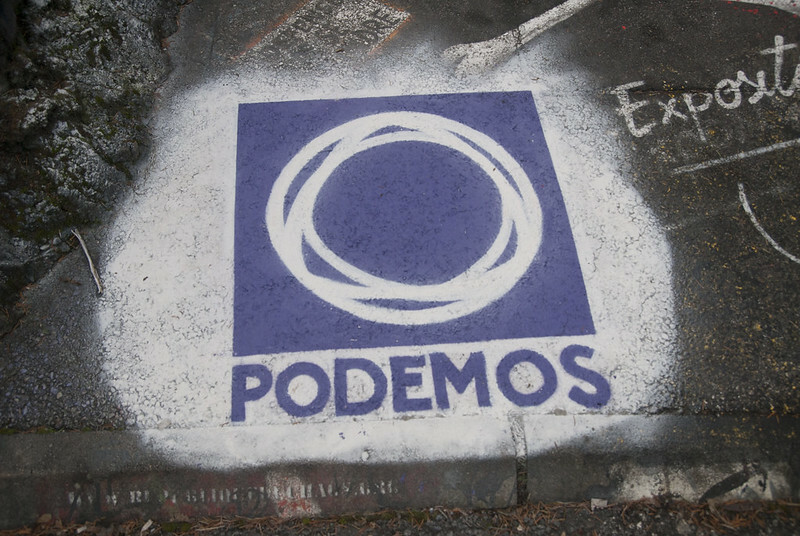 Though a left-wing media darling, Podemos has steered away from its commons-friendly, post-15M beginnings, morphing into a more traditional, hierarchical leftist party. With scant mention of the Commons in their official program, their economic strategy is decidedly pro-growth and Neo-Keynesian. Despite these shortcomings and the constant media bashing they’ve endured in the last year, they represent an explicitly anti-neoliberal (if not anti-capitalist or truly P2P) option capable of contesting the TTIP and other worrying developments sweeping over Europe. I urge you to read Carlos Delclós’ excellent book, Hope is a Promise: From the Indignados to the Rise of Podemos in Spain (available as an e-book from Zed), for an overview of the rise of Podemos and its love/hate relationship with the preceding 15M /Indignados movement. Intensely personal and honest, Delclós takes us through the last five years of political activity in the Spanish territory at the institutional level and, vitally, in the popular conscience and in the squares and streets. Hope is a Promise stands out as an eerily familiar overview and explanation of these radical times for me, having witnessed many of these moments first hand. It clearly dispels the ubiquitous “15M = Podemos” myth prevalent in much of the non-Spanish alternative media while outlining a more nuanced view (ie, “it’s complicated”). The book is also admirably succinct. At 96 pages, Delclós leaves nothing out while offering his well-reasoned views, without falling prey to theoretical overanalysis. I read it in a couple of hours. If you’re interested in Podemos, the Indignados and the future of Europe, I highly recommend you do the same. Over time it has become very common for people to refer to Podemos as the party of the indignados. But this is a misconception, first and foremost because the indignados were hostile to the very idea of representation. Underlying their message was an awareness that they were not a single people demanding a single program, but a multitude demanding more mechanisms and more power to decide how they would organise their lives and livelihoods. Though I make this claim based on the actual discourse of the acampadas, admittedly my view here may also be the result of a key linguistic distinction. In the plazas of Madrid, Seville and other Spanish cities, the rallying cry was the Castilian No nos representan. They do not represent us. In Barcelona, however, we declared that Ningú ens representa. No one represents us. 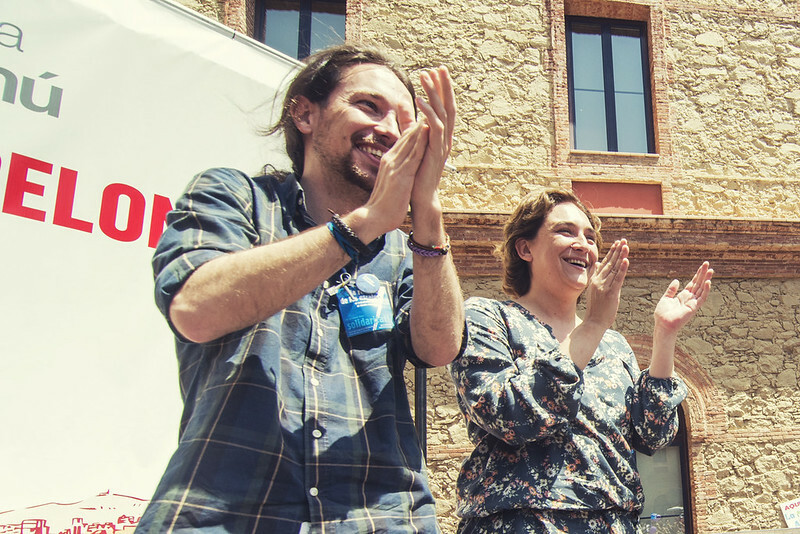 Another aspect that distinguishes Podemos from the indignados is the party’s support base. Though their message resonated far beyond their class composition, the indignados were largely composed of a relatively young, college-educated precariat. This was mostly due to the differences between what participation in a social movement entails and what participation in a political party entails. For instance, the indignados’ emphasis on direct action and slow, horizontal deliberation introduced something of a selection mechanism into actual participation in the movement. Consequently, people who were less versed in the culture of radical politics, had less time to spend in general assemblies, were not entirely comfortable with public speaking, were not particularly interested in learning new internet tools like Mumble or PiratePad and were not willing to take the risks associated with civil disobedience were gradually filtered out over time. In contrast, Podemos’s access to national television guaranteed contact with a somewhat older audience, which is extremely important in a country where decades of low fertility have given way to an older population structure. Moreover, the types of participation that Podemos enabled (namely, ballot boxes and smart phone apps) have a low learning curve, require less time and involve fewer risks than those favoured by the indignados. As a result, Podemos was able to complement its young, college-educated base with substantial support from working class, underprivileged and older groups, whose precarity generally comes with substantially greater risks than that of the indignados. It is also important to note that Podemos was not the first political party to be associated with the indignados. The first organisation to break with the movement’s taboo against entering the electoral arena was the Partido X, a Pirate Party-style network of technopolitical practitioners who proposed a radically horizontal, net-centric approach to electoral politics. Though they never really caught on with the general public, they introduced a number of fascinating ideas, uncovered several major corruption scandals and had a hand in some of the indignados’ major achievements. Perhaps the most notable of these was 15MpaRato, a crowdfunded campaign that brought Rodrigo Rato, a former Managing Director of the IMF and Spain’s Minister of the Economy from 1996 to 2004, to court for fraud, money laundering and concealment of assets. The other major examples of parties that were associated with the indignados before Podemos are found among the so-called radical left “nationalist” parties in Galicia and Catalonia. The first of these was Alternativa Galega de Esquerda (AGE), a coalition of federalist and left-wing independence parties led by Xose Manuel Beiras, a charismatic politician best known for his involvement in the antiglobalisation movement and for banging his parliamentary seat with his shoe in the style of Nikita Khrushchev as a sign of protest. In October 2012, AGE surprised many by becoming the third party in the Galician parliament, with roughly 14% of the vote. Pablo Iglesias played a key role in advising their campaign, which received considerable support from local 15M assemblies. The second left-wing independence party to be associated with the indignados was the Candidatura d’Unitat Popular (CUP) in Catalonia. Once a strictly “municipalist” candidacy composed of neighbourhood associations, social movements, radical left independence groups and prominent members of anarcho-syndicalist unions, the massive pro-independence rally on 11 September 2012 pushed them to run at the regional level in that year’s elections. Led by David Fernandez, a highly respected journalist and familiar face in Barcelona’s cooperativist movement, CUP won three seats in the 25 November elections. So while they weren’t the first to attempt to channel the energy of the indignados into the sphere of representation, Podemos were the first to seriously challenge the establishment parties in a battle for control of the central government. Their spectacular impact on the country’s political situation suggests that they understood the climate in the aftermath of the 2011 protests better than any other institutional political actor. They avoided interpreting the role of the social networks in connecting people and movements as support for a technopolitical, decentralized peer-to-peer ideology. Instead, they treated the social networks as a discursive laboratory through which to test and refine a common narrative that they would then take to the public arena in order to maximise its impact. At the same time, though they initially drew their legitimacy, structure and demands from the social movements, their intention was always to bring these to people who live beyond activists’ comfort zones. To put it bluntly, they wanted to take the discussion they saw on the social networks and in the codified spaces of the social movements to the murkier terrain of Spain’s bars, cafés and unemployment lines. But Pablo Iglesias and Podemos were not the only ones to throw their hat in the electoral ring in 2014. In June of that year, Ada Colau of the PAH also announced that she was willing to lead a candidacy to win back the city of Barcelona in the 2015 municipal elections, if it entailed catalysing a process of radical citizen participation. Her approach was similar to Pablo’s. The first step was to demonstrate popular support for the idea. Colau said she would run only if she received 30,000 signatures in support of the move, with half of those coming from residents of Barcelona and half coming from the rest of the Spanish state. The latter condition was intended to confirm the idea’s resonance in cities beyond Barcelona and the possibility of similar initiatives in the rest of Spain. There was, however, a key difference between Podemos and Colau’s project. While Podemos was designed as a single party (albeit one with channels for citizen participation that could potentially incorporate voices from outside the organisation), what came to be known as Barcelona En Comú proposed a civic list blending prominent, unaffiliated activists, community organisers and political independents with members of various left-wing parties, including Podemos, through primaries and an assembly based participatory process centred on a code of ethics and a common set of objectives. The idea caught on and similar candidacies emerged in cities all over Spain. These “citizens’ confluence” candidacies were remarkably successful in the 2015 municipal elections. Today Madrid, Barcelona, Zaragoza, Badalona, Santiago de Compostela, Iruña, A Coruña and the country’s unemployment capital Cádiz are being governed by prominent social activists.